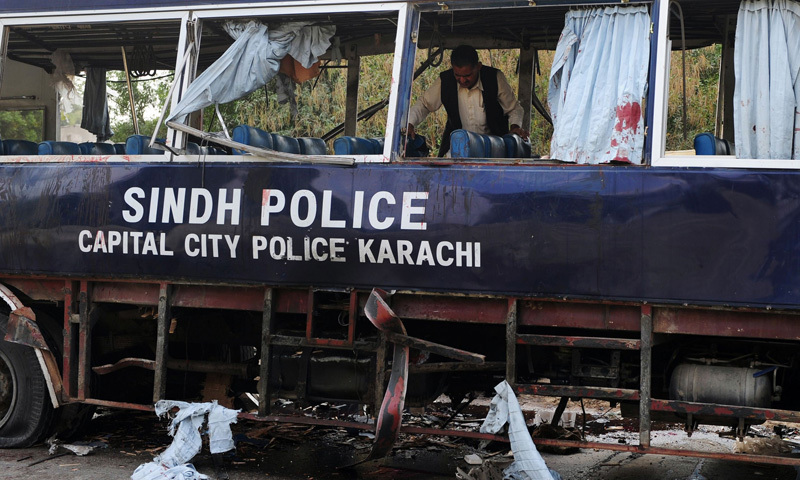 KARACHI: The Tehrik-i-Taliban Pakistan (TTP) claimed responsibility Thursday for an explosion targeting a police bus near Razzaqabad police training college in Karachi's Shah Latif Town in which 13 policemen were killed and 47 others, including civilians, were wounded, DawnNews reported. The attack came early in the morning. 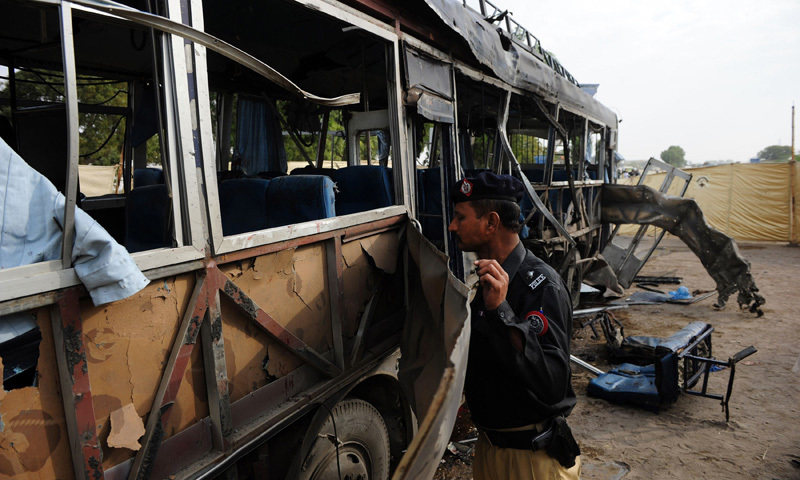 “Apparently an explosive-laden car hit the police bus transporting officials for security duty,” Muhammad Iqbal, a senior police official, told AFP. Rescue teams reached the site of attack whereas the victims were shifted to Jinnah Hospital and a private hospital nearby in the locality. 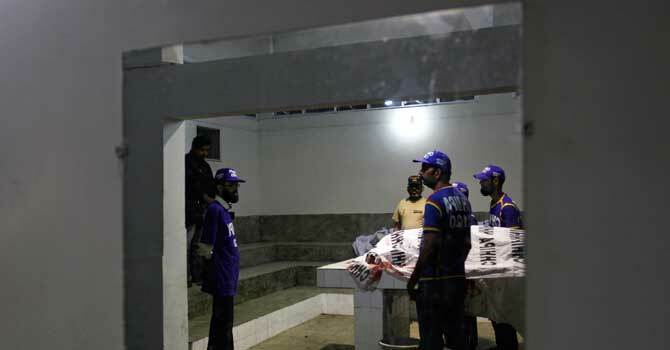 Doctor Seemin Jamali at Karachi's Jinnah hospital confirmed that there were at least 11 dead. At least 47 wounded officers were hospitalised, 10 of whom were in critical condition, she said. 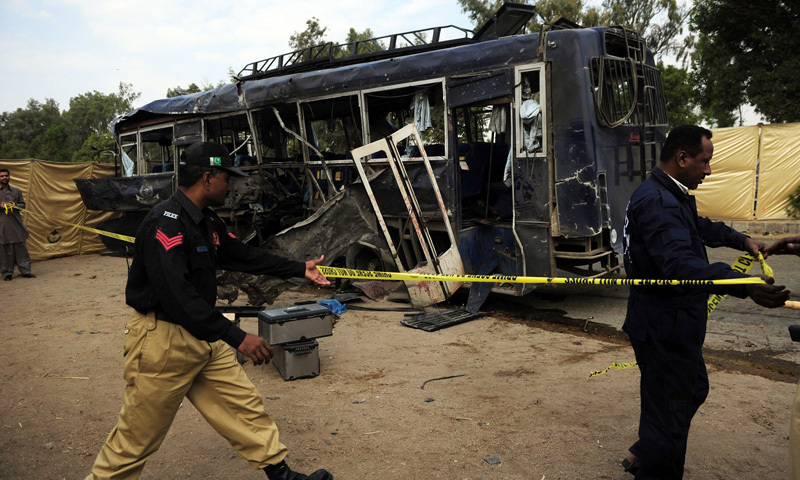 Speaking to Dawn.com, Pakistani Taliban spokesman Shahidullah Shahid claimed responsibility for the attack and said it was a revenge attack for killing militants. He said TTP workers were victims to targeted killings in Mardan, Swabi and Peshawar, adding that the attack was in response to that. 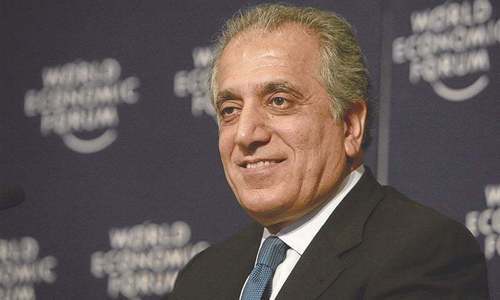 “Our defensive war will continue until an agreement is reached on a ceasefire” between negotiation teams representing the government and the Taliban, he told AFP. SSP Farooq Awan, who heads a special investigative unit, said the bus was making a U-turn after leaving a training centre when a small van struck it. However a CID official refuted the claim that the bombing was carried out by a suicide attacker and said that no body parts were found from the site to support the notion. The official added that blast appeared to have been carried out using a remote-controlled detonator. According to initial reports, 25 to 30 kilograms of explosives were used in the attack. 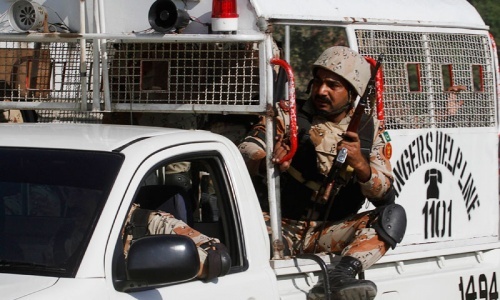 Police said that more than 50 officers were boarding the vehicle at the time of attack, which occurred in the eastern district of Karachi close to the national highway. 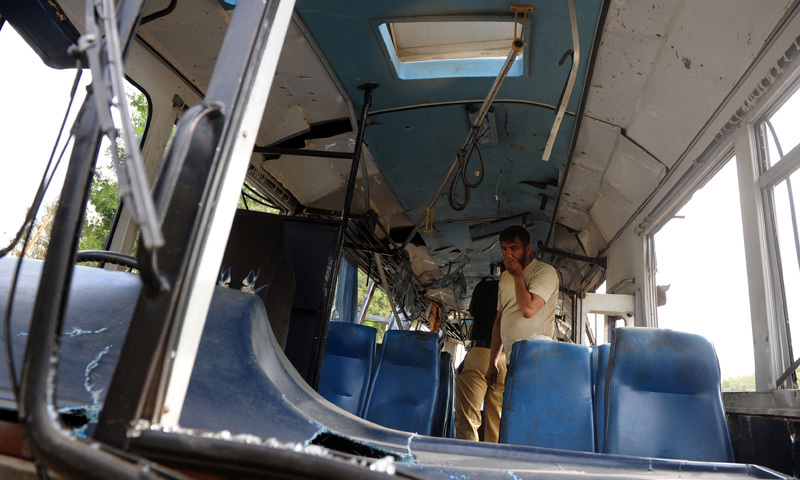 “Around 50-55 policemen were boarding the bus and going somewhere for duty from their training centre,” Iqbal said adding that police suspect it was a suicide attack. 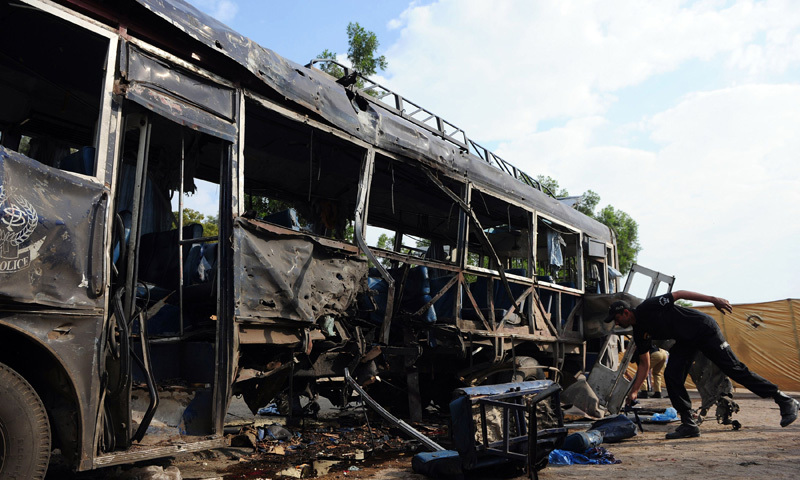 The rear portion of the targeted bus was completely destroyed in the explosion. Moreover, additional contingents of police, Rangers and the Bomb Disposal Squad (BDS) reached the spot and cordoned off the area as a probe into the incident went underway. The intensive blast was heard in a radius of two kilometres. “We are investigating this attack from all angles and who had the most to lose by the forces' actions and want harm upon them. But the forces will not be demoralised and will work more aggressively,” Sharjeel Memon, minister for information in the southern province of Sindh which includes Karachi, told reporters. Moreover, President Mamnoon Hussain, Balochistan Chief Minister Abdul Malik Baloch, Muttahida Qaumi Movement chief Altaf Hussain and the Majlis Wahdat-i-Muslimeen (MWM) issued statements in condemnation of the attack . We will still indulge ourselves in "Piece Talks"
Hmmm, latest Taliban negotiation tactic to put pressure on the government??? These awful bombings. Will they never stop? I read that next door to Pakistan, President Karzai is going to release 65 or so terrorists who are familiar with bomb making. Does he really think these bombmakers will spare his country? It looks to me like the Taliban spares no one. I'm so sorry for the deaths and maiming caused by these people. We all should rise up, but the entire world seems to be sleeping. Here is the start of MQM protect against Karachi Police. very sad. killing of Pakistani police doesn't even make news now a days. The security forces waiting for whom? While Taliban kill people everyday in guise of negotiations, our Army is sitting with crossed fingers. What an irony? There is Sindh festival being celebrated,and bomb blast in Karachi,in Sindh. karachi has become a dangerous city to live in. With relentless bombings of this nature any other country would've been in lockdown right now and trying to wipe out the militants. But Pakistanis go about with Sindh festivals and dolphin shows as if they just don't care about the victims of terror. I think Pakistani Govt should also start doing similar kind of defensive activities in North Waziristan areas before a cease fire agreement is reached. Why Pakistani Govt is holding its guns. When innocent people are getting killed every day. Enough with these dialogues with terrorists. PTI and JI had always spoke in favour of TTP and linked suicide to drones, well, have they come out to support the victims and their families and who would they now term as martyrs. In American football there are players in the team whose sole duty is to divert attention and engagement of the opponent team from the player actually carrying the ball to the touch down line. They create confusions to ensure that the player carrying the ball could carry on his mission without much resistance. That is exactly what people like IK and other TTP apologist journalists are doing, they may not be carrying out acts themselves but are in the same team. are not TTP and Pakistani Gov negotiating or trying to negotiate at the moment..?? I would tell the PM talk to the TTP in this same manner. Explosion for Explosion. For every explosion there should be 4 Drone strikes at their bases. that would drill some sense into these people. These TTP criminals only understand one language, government should talk to them in the language of force. Nation must support the government in diminishing this cancer of TTP from the society. Anyone who points out a den of TTP criminals should be rewarded with Rs. 100,000. How many innocent Pakistani will be martyred before our govt will wakeup to deal with this maniac? Pakistan might be the only state on this earth which will allow terrorist to act with impunity without any consequences. Enough is enough, Govt must draw RED LINE. How long this Mazzak Raat continue and how much innocent blood will be allowed to shed before army action will be carried out against TTP and their political wing like Tehrik-e-Insaaf, JUI-F and S, JI and Burqa clad Abdul Aziz. On the one hand Govt of Pakistan is negotiating peace with TTP and on the other hand they are killing our innocent people(In fact govt officials). Are they serious about talks? Are we having talks with them because we cannot control the situation? I am supportive of USA policy of no negotiations with terrorists period. So much for giving peace talks another try and TTP is doing business as usual. nice article with detailed but recently we have heard that atack was happen with the remote control device..
Time for the pml(n) and pti to maybe hold more talks with the taliban ? Taliban and their Supporters should know that Islamic law is clearly against terrorism, against any kind of deliberate killing of civilians or similar 'collateral damage.Political and religious parties who supported dialogue between TTP and Pakistan Government are equally responsible for Taliban acts. This is not a battle between the Pakistan and TTP, but between the free and peaceful Pakistan and terrorism. And we continue to negotiate. Lack of action is the reasons that the army steps in and removes the democraticly elected government. 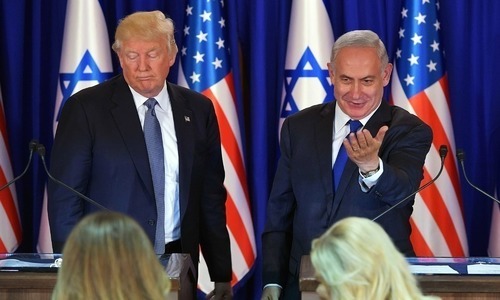 On one side they are talking to a team and declaring that they are not involved in past activities and on the other side are killing innocent people. What is their agenda? If Maulana Aziz of Lal Masjid knows their designs he must be hanged for being involved in all such crimes. How many more lives need to be lost, before we realize that we are dealing with barbarians - we are dealing with criminals who do not possess common sense, who are in fact, psychopaths and cannot comprehend what pain they are inflicting on innocent victims and their families. Their minds are not programmed to look at things rationally. They would not care about victims, be it their "suicide bombers" or innocent victims that are blown away or shot dead. As long as they are well sheltered and under utmost protection, they will not care if their own people continue to die, as long as they are continuing to terrorize others. They will find any excuse in the book to convince their followers that their cause is just. They will practice just the opposite of what they are preaching. They are murderers and they must be stopped. No more negotiations - just action to eliminate all the Talibans from the face of the earth. We can't afford anything short of that. While we carry on meaningless negotiations with terrorists they keep killing innocent people. If Pakistanis keep electing people like Nawaz Sharif, Imran Kan, Maulana Sami-ul-Haq and company then they deserve then this will continue.. Either police should be given the protective armour that Army has or preferably the Army should step forward and take over more responsibility. With our international borders being quite, Army has no legitimate role left except to fight the domestic enemies. Its sad that the life of a Pakistani policeman is cheaper than the life of a Security personnel +++++++++++++++++++++++++++++++++++++++++++++++ 11 dead soldiers and there would have been a massive retaliation by the army. seems that the TTP have also discovered the difference. Is this government waiting to negotiate the surrender of Pakistan with Taliban, curtail the lavish life style and stop misusing tax payer money, all public money should be directed towards complete destruction of talibans through outright army action. very sad.I have no words to explain my sorrow.Solute to all policemen who sacrificed their life,and solute to those policemen who work in these conditions.The whole nation needs to mourn these deaths.God give their families the strength to face this tragedy.I can not believe that we are still trying to talk to talibans.They are accepting that they have done this,there is no doubt about their nature and their plans.Can Imran Khan,Nawaz sharif or any other politician who favor talks with taliban explain this.Can they tell me that what is the punishment for murder in Islam.It's very simple and straight forward question.None of them will respond,but they will hide behind the curtain of politics of compromise and religion.Wah bhai wah,NO VALUE OF DEATHS GABROO JAVANS.They are sons,fathers,brothers and MAJAZI KHUDA of some one.They will keep on dying like this,they will keep on shedding their blood.And we will keep on watching it , WHY. Instead to load 50 to 60 police officers in one bus make use of two to three minibuses to split the load Dispatch each minibuses on some interval of time also 2.. Do not use police vehicles rather windowless private vehicles to make terrorists confused. 3 . A security vehicles with proper monitoring equipment to monitor the traps of remote controlled explosives. Proper swift measures to be taken if found some traps o. To choose different routes for each minibuses o To consider air transportation (helicopter ) instead ground one. All long terms are such as bullet proof vehicles, as well protective equipment to be worn. Really strange, TTP is killing security forces like any thing even when there are negotiations are going on for the peace. Does this mean Pakistan military is not capable for protecting there country. Why nawaz sharif is so keen in these kinds of dialogs. There should be a strict military action against these terrorists who kills so many innocent people. Damned you talk, damned you don't as the military says that its chances of winning the war is remote. Who will save Pakistan now is a million dollar question and how ?